In vivo monitoring of human knee implants after total arthroplasty increases information concerning articular motion and loading conditions. 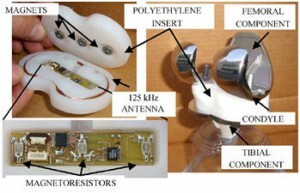 The autonomous sensor proposed carries out force measurements in a protected environment and wirelessly transmits data directly from the inside of the implant to an external readout unit. The autonomous sensor is fully contained in the polyethylene insert. Batteries are completely eliminated; the system gathers energy from an externally applied magnetic field using a miniature coil inside the implant. 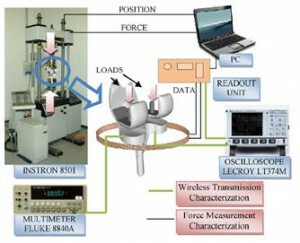 The data generated from this device will provide data for new designs, techniques and implementations. The forces transmitted across the knee joint during normal human activities such as walking, running or climbing can be directly measured. Furthermore, the device can be used to improve design, refine surgical instrumentation, guide post-operative physical therapy and detect human activities that can overload the implant.